shock caused by electric current passing through the body. 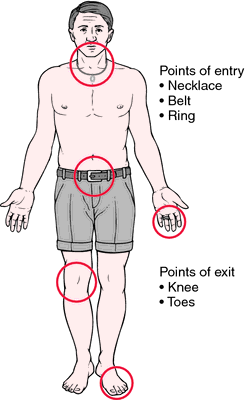 Common points of entry and exit for electrical burns. Severe internal damage can occur between these points. From Frazier et al., 2000. The longer the contact with electricity, the smaller the chance of survival. The victim's breathing may stop, and the body may appear stiff. In giving first aid, first the electric contact is broken as quickly as possible; this must be done with care so that the rescuer does not have exposure to the current. The rescuer, keeping in mind that water and metals are conductors of electricity, stands on a dry surface and does not touch the victim or electric wire with the bare hands. If the victim has stopped breathing and has no pulse, cardiopulmonary resuscitation is begun immediately. the sum of immediate and delayed pathophysiologic responses of living tissue to a current of electricity of sufficient magnitude to induce abnormal sensations (for example, paresthesia, pain) or objective changes (for example, muscle spasm, cardiac arrhythmia, neurologic impairment including coma, tissue damage). a traumatic physical state caused by the passage of electric current through the body. It usually involves accidental contact with exposed parts of electric circuits in home appliances and domestic power supplies but may also result from lightning or contact with high-voltage wires. The resultant damage depends on the intensity of the electric current, the type of current, and the duration and the frequency of current flow. Alternating current (AC), direct current (DC), and mixed current cause different kinds and degrees of damage. High-frequency current produces more heat than low-frequency current and can cause burns, coagulation, and necrosis of affected body parts. Low-frequency current can burn tissues if the area of contact is small and concentrated. Severe electric shock commonly causes unconsciousness, respiratory paralysis, muscle contractions, bone fractures, and cardiac disorders. Even passage of small electric currents through the heart can cause fibrillation. About 1000 persons in the United States die from electric shock each year. Treatment may involve such measures as cardiopulmonary resuscitation, defibrillation, and IV administration of electrolytes to help stabilize vital functions. See also cardiogenic shock, hypovolemic shock. A traumatic state following the passage of an electrical current through the body. Sum of immediate and delayed pathophysiologic responses of living tissue to electrical current of sufficient magnitude to induce abnormal sensations or objective changes. The electronic training collars are devices which allow electric shocks to be applied to pets, specifically cats anddogs. How come the same electric shock phenomenon also occurs in tropical countries like the Philippines where there's no frosty weather? Why do some people give you a 'shock'? She also suffered a neck injury due to the force of the electric shock. Punishments can be in a form of a simple vibration, a sound reminder, making the wearer pay a fee or hitting the wearer with a mild electric shock of up to 300 volts, (http://www. The source pointed out that the so-called Abu Suleiman, a doctor who works inside a field hospital belong to the IS in Jalawla was killed by an electric shock inside the hospital, which works by a small size generator. Ram Kali Prajapati, 34, was put in a pit and covered with a heap of mud on September 21 after she received an electric shock on accidentally coming in touch with a highvoltage wire. Washington, July 4 ( ANI ): A new study has revealed that people rather prefer engaging in activities, even the unpleasant ones like electric shocks, than doing nothing and just thinking alone. USA, Nersesian announced that a representative of Deno Gold Mining Company applied electric shock to miners. Summary: A man was found dead apparently from electric shock outside the village of Barsa in Koura and police called on his relatives to identify the body, police said Thursday.